Superman has now arrived at the invisible, abandoned alien space station that floats among the debris that was once New Krypton. This is where Supergirl, Superboy, Steel, Cyborg Superman (Hank Henshaw), and the Eradicator all were brought as captives after their battles with Doomsday. Superman and the others have just discovered the lifeless body of the original Doomsday; but have also discovered three new Doomsday clones that were created by Lex as part of Project 7734. 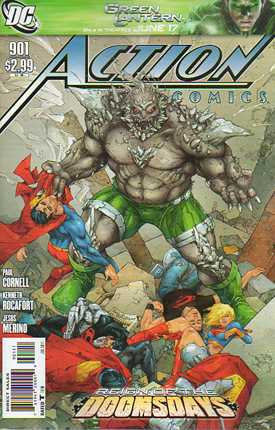 It was not the original Doomsday, but these Doomsday clones that had engaged in battle with Supergirl, Superboy, Steel, and the others. Cyborg Superman is still babbling about wanting to die; but Superman has no patience for this "nonsense" in light of their current critical situation, and quickly removes Henshaw's central node to temporarily disable him. The Doomsdays prepare to attack, and Steel puts up a force field to temporarily slow them down. Superman urges the others to follow him so that they can find the control room, regroup, and plan their strategy. Superman asks them to bring Doomsday's body along. The interior of the ship is a pocket universe, seemingly unbounded. Each corridor goes on forever, and then turns back on itself. Escaping will not be easy. Superman says that getting out will be ten times harder than getting in was. He suggests they search for clues that indicate how the Doomsdays came and went. Somebody is watching the heroes, but we don't know who just yet. That somebody presses a button on a computer panel that causes the space station, which also seems to be a spaceship, to accelerate to maximum speed. Supergirl has figured out that one of the reasons Superman wanted to bring the body of Doomsday along is to protect it from the Doomsday clones. She hugs her cousin and compliments him for his compassion, to even care for the beast that once destroyed him. Supergirl reveals that she had previously thrown one of the Doomsdays down an endless tunnel, from which he has not yet escaped. Superman remarks that this tactic may be useful later on as a possible interim solution. Steel indicates that there is latent brain activity in the body of the original Doomsday, which will likely resurface at some point. Eradicator points out writings in an alien language on the wall. Superman and Eradicator agree that translating it should be part of their plans. They know that whatever they do, they will have to keep moving, because the Doomsdays will be in hot pursuit. They hear a commotion, and Superman and the other heroes go to check it out. They again find the Doomsday clones, who mount a heat vision attack. Superman retaliates with a couple of powerful and effective punches. The whole time, he is giving himself a pep-talk, expressing his hope and determination that they will find an exit somehow. He is determined to find his way back to Lois. Eradicator suggests to the others that they execute a group attack to overwhelm the Doomsdays. This is an approach that the New Kryptonians once used against the original Doomsday with great success. But when the New Kryptonians did it (back in Action Comics #871), they attacked with a large group, maybe 20 or more fully-powered Kryptonians against a single Doomsday. Here with odds that are much more unfavorable (five heroes, three Doomsdays), the tactic fails badly, and the attack is repulsed rather quickly and violently. At U.S.A.F. Space Command at Peterson Air Force Base in Colorado, military personnel detect and report a massive object bearing down on Earth at near-light speed. When asked by his superior officer for the short description of the situation, the Lieutenant nervously exclaims "Sir, we are ten minutes away from a planetary extinction event!" The look on his face reveals utter panic. Superman, watching the others struggle against the Doomsdays, calls out for everybody to fly upward towards the gap directly above. Superman indicates that perseverance will be required, because winning is going to take a long time. At the White House, President Obama makes an urgent TV appeal to the entire superhero community for immediate help in this grave situation. He mentions the Justice League, but then specifically asks for Superman by name. Back inside the pocket universe/spaceship/space station, the five heroes who wear the 'S' have discovered an observation deck. Looking at the monitors, Supergirl discovers a grizzly fact: in just a second or two, the image of the Earth has gotten noticeably bigger. This reveals where they are headed, and immediately reveals the gravity of the situation. Although they are not aware of the President's speech, clearly their traveling space station is the massive object on a collision course with Earth that the military warned the President about. Acting as the de facto leader of the group, Superman says "I need your best game right now", urging the others to rip out the facades on the walls looking for any hidden engine controls that will allow them to change course. They then get their next surprise. They are confronted by a "Doomsday-like" creature who says he is the death of Doomsdays, and goes by the name of Doomslayer. The implication is that he is even more powerful than the Doomsdays. Doomslayer asserts that the station's course must not be altered, and that Earth must be destroyed. Superman wisely chooses to momentarily defer until they can determine what they are really up against; but Eradicator brashly surges forward and gives Doomslayer some lip. Eradicator feels his abilities will protect him, and hopes to stall the creature so that the remaining super-team can flee. But Doomslayer quickly grabs Eradicator and goes into a rage, releasing immense destructive power. To the horror of everyone watching, Eradicator is, well... eradicated!! Story - 4: Paul Cornell has a unique style that I am still getting used to. He can be a little cryptic at times. I believe this is deliberate. He likes to throw surprises at the reader. He likes to keep you guessing. We saw that during the "Black Ring" story arc, and we see it again here. I find myself reading a scene, questioning its logic or plausibility, and then re-reading it and mulling it over. I had to read this story twice to get fully engaged; and I liked it better on the second reading. This story is a bit like a mystery novel. You ask yourself a lot of questions as you go. For example, who created this space station? It is never stated; but we know a few facts. On page 3, it states that Lex Luthor found this alien ship, and made a few additions to it. But who did it belong to? My best guess is that it is Brainiac technology, just as the planet New Krypton was. Brainiac either created it himself or stole it from some other civilization. How long has the station been hidden among the rubble of New Krypton? Was it transported recently from somewhere else? If so, then who transported it, and why? Where did it come from? Is the cloaking device that renders the ship invisible also Brainiac technology? Whatever race created the space station, it was certainly not Kryptonians, since Superman is currently unable to decipher the language written on the wall. Next question: How many Doomsdays are there? Besides the original, we see three more. But Supergirl says she threw one down an "endless tunnel" and it never returned. So there must be four. This is ironic, since in issue #900, we saw Supergirl punch Doomsday into that tunnel, and then we saw Doomsday again right away, fooling everyone into thinking that Doomsday had quickly escaped from the tunnel. Obviously, this was an illusion, since it must have been a different Doomsday. The group was not yet aware that there were multiple Doomsdays. So there is the unconscious body of the original Doomsday, at least four additional Doomsday clones created by Lex; and then there is Doomslayer! OK, where did *he* come from? Was he created by Lex also? Is he there just to pose another threat in Luthor's trap, or does he have another purpose? He says he is "the death of Doomsdays". What exactly does that imply? Will he somehow eventually be responsible for the deaths of the Doomsday clones? And why does Doomslayer say that Earth must be destroyed? Another question: Why rip out the facades, rather than use x-ray vision to search for the engine controls. I must conclude that the panels are lined with lead or some other alien metal that resists x-ray vision. Paul Cornell's idea of an invisible space station that doubles as a spaceship and whose interior is a "pocket universe" with "endless tunnels" is very imaginative. The fact that it is stocked with Doomsdays and difficult to escape from makes it the perfect trap for Superman and his young allies. As Henshaw pointed out in issue #900, they are like mice trapped in a cage and being stalked by a cat. On page two, when Superman essentially rips out Henshaw's electronic heart, I was trying to decide if this was out of character. I guess Superman would not ordinarily do this maneuver; but they are in an extreme situation, calling for drastic action. Although he is coy about it, we know that Superman will definitely put the central node back in when they have achieved victory. This story arc will be around for at least a couple more issues. Superman tells us this on page 14 when he says, "Winning this is going to take a long time." I hope that my questions will be answered along the way. It is good to see Superman, Supergirl, and Superboy together in the same book. This story is big enough to justify that. And it is great to have Superman back in Action Comics! It has been a long time coming! Art - 4: Kenneth Rocafort is the new artist for Action Comics, as we say goodbye to Pete Woods. Rocafort and Jesus Merino share the art duties this time around. Rocafort has a gritty style that I think I like. But I need to see more of his work to be certain. I like his detailed backgrounds in this issue. The images of the spaceship walls and ceilings create a feeling of claustrophobia that is perfect for this story. There are also a couple of images that stand out for me. I like the images of Supergirl on page 6, especially the image of Kara hugging her cousin. I also like the natural-looking pose of Superman on page 8, hovering nonchalantly a couple of feet off the ground as he discusses the alien writings on the wall with Eradicator. There are a couple of great images within the Merino section (pages 11-17). I like the look of sheer terror on the face of the Lieutenant as he says to his superior officer "Sir, we are ten minutes away from a planetary extinction event! ", which is military speak for "We are toast!" We are also treated to a terrific image of President Obama at the bottom of page 15. It looks just like him! I like the image of the White House logo behind him. Cover Art - 5: The Rocafort cover is outstanding! 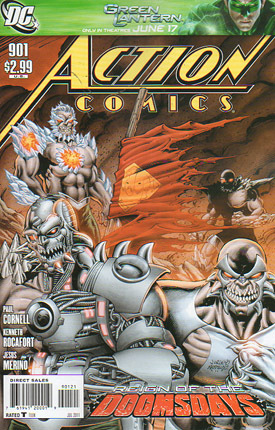 Doomsday strikes a menacing pose in the center of the cover. All the heroes are unconscious after taking a beating from Doomsday. Superman dangles limply from Doomsday's grasp, while Supergirl, Superboy, Steel, Eradicator, and Cyborg Superman lie in a heap at Doomsday's feet. Variant Cover Art - 2: Several Doomsdays huddle together. Another Doomsday is in the background. In the center we have the classic image of Superman's shredded cape wrapped around a stick and flapping in the breeze, taken from the Death of Superman story arc in the 1990s. I do not like this cover! It is very crowded. The layout is all wrong. I suggest you choose the original cover. That is definitely the way to go!